We connected our carbon electrodes to a power source. We had a solution of sodium sulphate as an old familiar recipe precribes. We dripped BTB into it which is a pH indicator. Power on and at both electrodes, it bubbled slightly. At the anode, it became yellow, indicating that became acidic, hydrogen ions. At the cathode, it became blue, basic with hydroxide ions. Today when we rehearsed electrolysis pondering why the recipe prescribed sodium sulphat because we found that it did not participate in the reactions. We then tried to do the same with water alone. It was the same result but it took much longer time. One student suggested that we take common salt, sodium chloride. Said and done we did. Again the same result but it went faster, as fast as with sodium sulfate. 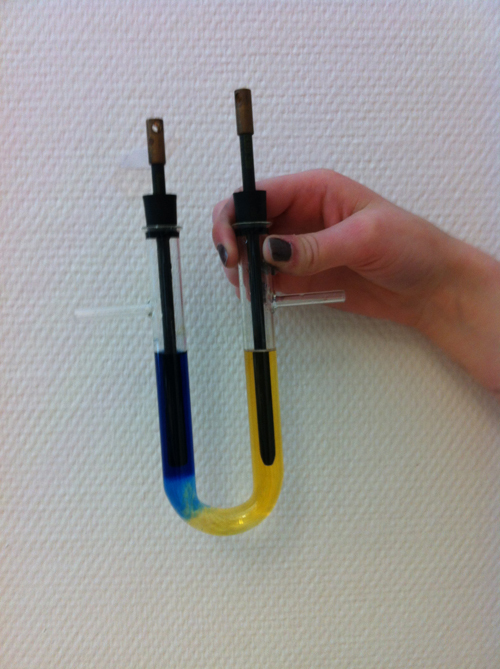 See a close up picture of the electrolysis. From the beginning it was greenish colour in the solution. When searching online, you always have sodium sulphat in this electrolysis. Why? I think it's just the case of a habit. Simply having water takes too long time, when there are ions in the water, it's faster, ions probably helps to convey the power.